At Uni-Pak we acknowledge and understand the importance of waste minimization, especially since all our products are purchased and used by end users usually only for a short period of time before becoming regarded as waste. When people buy food and drinks in disposable containers they are also buying the packaging. With our busy lifestyles, and our consumption of convenience food and drink, we must all take responsibility for disposing of used packaging correctly (based on local council collection guidelines). Uni-Pak encourages everyone to take ownership of waste disposal and promotes the correct recycling of used packaging were possible. Uni-Pak endeavours to manage its operations in a sustainable manner and supply, where feasible, recyclable and biodegradable products. > We accept responsibility for maintaining a healthy environment and a sustainable future. 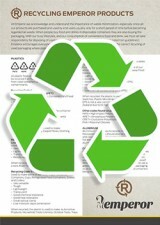 > We promote the recycling of our products and offer compostable product options where feasible. > We optimise our visit and travel plans to reduce CO2 emissions, and manage our fuel and energy use wisely. > We reduce our waste output to landfills and increase our use of sustainable office consumables. Uni-Pak is constantly analyzing our supply channels to offer products which are sustainably better than current offerings. Uni-Pak is appointed the sole NZ distributor of the Bastion, Emperor and Green Choice range. 69B Portage Road, Otahuhu, Auckland. 22 Clarence Street South, Christchurch.